The Cluster Observer is a supervising component in the cluster. It monitors the nodes health and adjusts the nodes state in the Database Group accordingly. For each database, it sets the nodes state within the Database Group, thus determining the Database Group Topology. The Observer is always running on the Leader node, it requires a consensus to operate. If there is no Leader, no Database Group Topology decisions can be made. The Observer will add the node as Promotable. Once the node has caught up with the state of the Database Group, fully updated with the database data and finished indexing the last data sent to it, the Observer will promote it to a full Member. Set the node to a Rehab state. 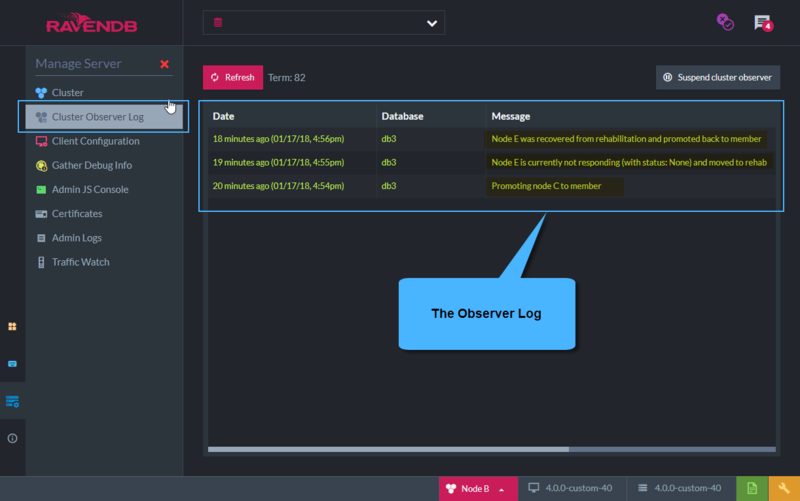 then after a pre-configured time period, the Observer will add another node from the cluster to the Database Group in order to keep the replication factor. The replacement node will be set to Promotable and will start catching up data from the other nodes in the group. 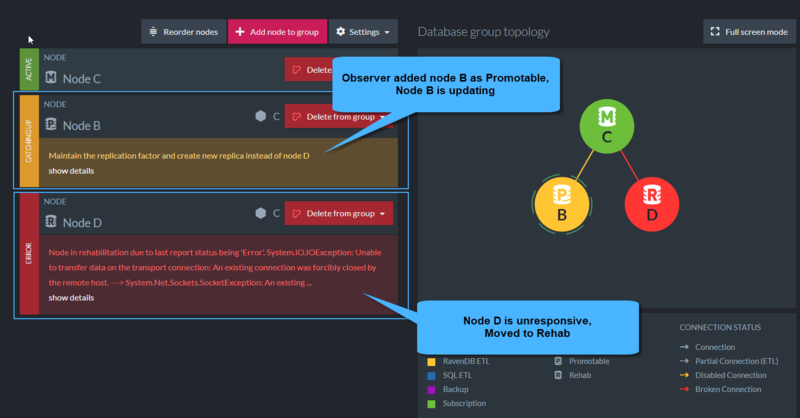 The Observer will Update the Database Group Topology with these changes so that each node in the Database Group will re-calculate his work assignments. then the Observer will delete the node that came back from the Database Group Topology. then the Observer will set the Rehab node to Promotable so that it starts updating. so the Observer will go ahead and delete the extra node, either the replacement one or the Rehab one - whoever is the last to be fully updated. 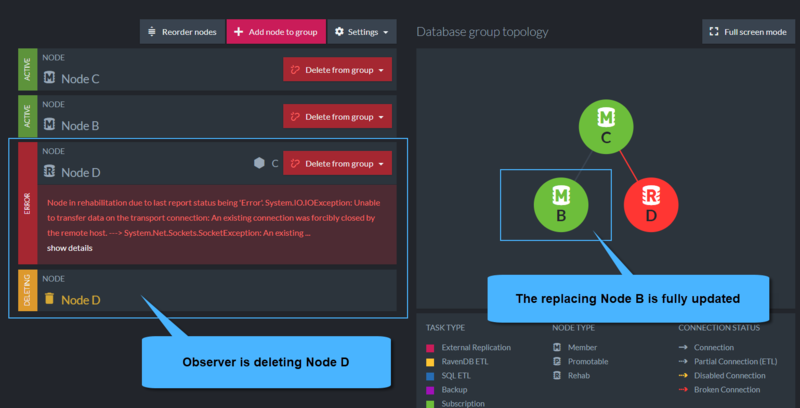 Either way, deletion of a node will not occur before the Observer verifies that all data to be deleted from the node was replicated to the Database Group members. 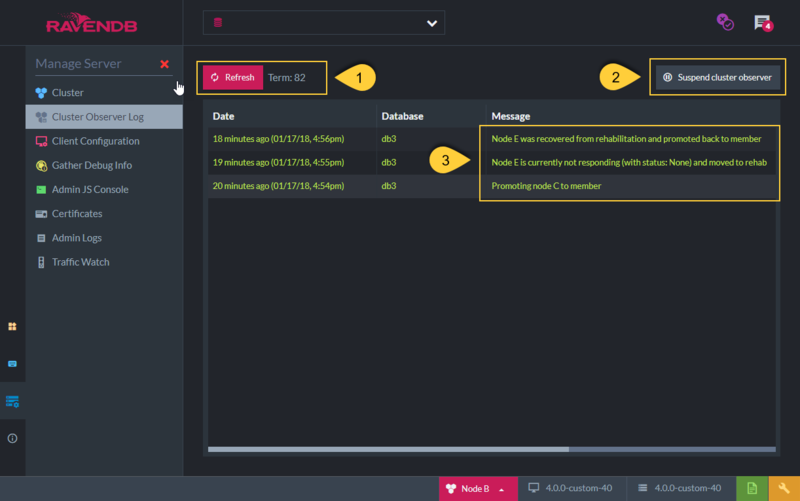 The Rehab node will start catching up data from the other members in the relevant Databases Groups. Once it is fully updated, the Observer will directly promote it to a full Member in the Database Group Topology.